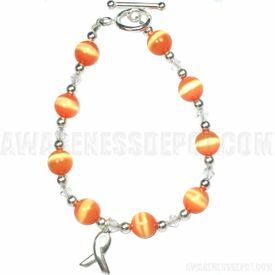 This Kidney Cancer Awareness bracelet consisting of Swarovski crystals, orange beads and sterling silver round beads, fiber optic cat's eye beads, and silver Kidney Cancer Awareness ribbon. This bracelet helps support victims and their fight against kidney cancer. This kidney cancer Awareness bracelet is 8 1/2 inches in length. This kidney cancer Awareness bracelet is a great way to show your support for Kidney Cancer Awareness and share with others. Be sure to check out all our Kidney Cancer Products!